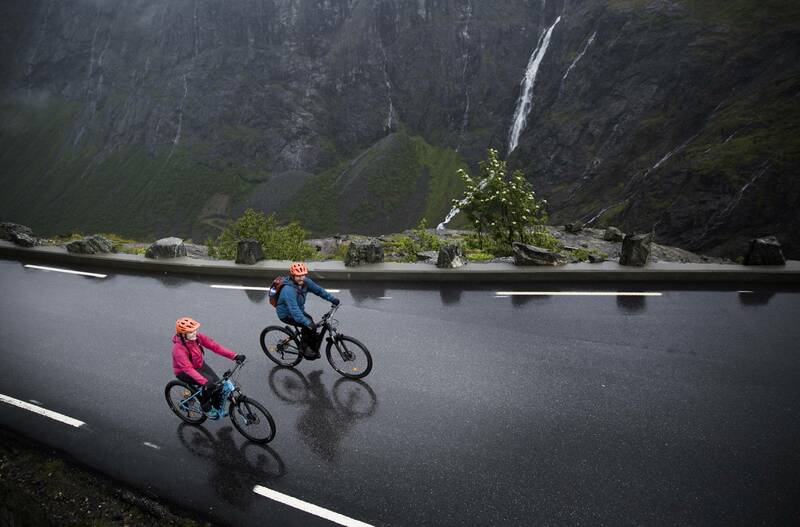 Experience Romsdalen with electric bikes. Our guides will show you the best of Romsdalen in two hours on the trail! This is a perfect tour for you who want a taste of adventure. We will try out our electric bikes around in Åndalsnes, both on asphalt and some trails. An exciting adventure with stunning nature around us. We will guarantee big smiles as we roll on. Enjoy fresh air and fabulous views when we ride along the river, through the town of Åndalsnes and into the forest. The good thing about electric bikes, is that each person can choose how much power they want to use. You don’t have to be in good shape, you will easily get around without getting tired. The tour is good for everyone who can ride a normal bike. Small daypack with water bottle, snack, windproof jacket and some extra clothes (you never know about the weather/temperature). Take a look at our afternoon ride by following the link below. Meeting point at Hotel Aak by the reception at 4.30 PM. We will find equipment and bikes that fits everyone. When we are ready, we will test the bikes a little before we roll away to our adventure. We return to the hotel and check out the equipment before the tour ends. After Bike for those who want in the bar at the Hotel. A different kind of sightseeing with guide and electric bikes. Ride close to - and into the beautiful, Norwegian nature. See a lot of Romsdalen in a short time. Hand picked guides that makes your adventure safe and fun!